Practice Digital Circuits questions and answers for interviews, campus placements, online tests, aptitude tests, quizzes and competitive exams. This set of Digital Electronic/Circuits Multiple Choice Questions & Answers focuses on “Demultiplexers(Data Distributors) – 2”. 1. Why is a demultiplexer called a data distributor? Explanation: A demultiplexer sends a single input to multiple outputs, depending on the select lines. For one input, the demultiplexer gives several outputs. That is why it is called a data distributor. 2. Most demultiplexers facilitate which type of conversion? Explanation: A demultiplexer sends a single input to multiple outputs, depending on the select lines. Demultiplexer converts single input into multiple outputs. 3. In 1-to-4 demultiplexer, how many select lines are required? Explanation: The formula for total no. of outputs is given by 2n, where n is the no. of select lines. Therefore, for 1:4 demultiplexer, 2 select lines are required. Explanation: A demultiplexer sends a single input to multiple outputs, depending on the select lines. As the select input changes, the output of the multiplexer varies according to that input. For C0 =1 and C1 =1, Y3 will be the output as 0 and 1 are the bit combinations of 1. 6. How many select lines are required for a 1-to-8 demultiplexer? Explanation: The formula for total no. of outputs is given by 2n, where n is the no. of select lines. In this case n = 3 since 23 = 8. 7. How many AND gates are required for a 1-to-8 multiplexer? Explanation: The number of AND gates required will be equal to the number of outputs in a demultiplexer, which are 8. 8. 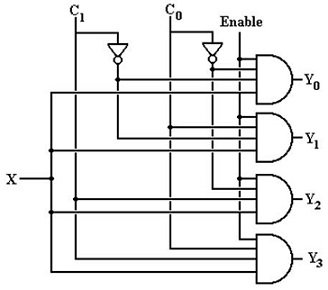 Which IC is used for the implementation of 1-to-16 DEMUX? Explanation: IC 74154 is used for the implementation of 1-to-16 DEMUX, whose output is inverted input. 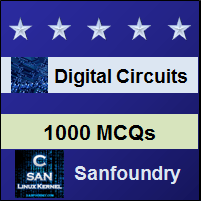 Sanfoundry Global Education & Learning Series – Digital Circuits. To practice all areas of Digital Electronic Circuits, here is complete set of 1000+ Multiple Choice Questions and Answers.